First of all, we shouldn’t be getting sunburn. It’s not cute and it increases your risk of skin cancer by like, a million. But sometimes it happens (even to me, as judgey as I am about it). If you’re out in the sun, I say always wear SPF 30 or higher (YOU CAN STILL TAN THROUGH IT, YOU GUYS), and once you have a strong base tan mid-summer, you can occasionally switch to SPF 15 unless you are super fair-skinned (but remember, I’m not a doctor). But for the love of God, always wear 30 on your freaking face. Now let’s talk about when you’re feeling the burn. Goal #1: For the pain to stop. Goal #3: Turn the red into beautiful bronze. Here’s the best way to handle it. Step 1: Layer aloe vera aftersun gel WITH LIDOCAINE (must be the blue kind!) all over the burn. Let it dry. Smear it on AGAIN and let it dry. I am convinced the magic lies in the second layer. Step 2: Mix two parts aloe vera aftersun lotion (you can go cheap and old-school with Banana Boat) with one part coconut oil and use this as your moisturizer all over your body. Step 3: Repeat daily until the burn subsides and you’re a bronze beauty. 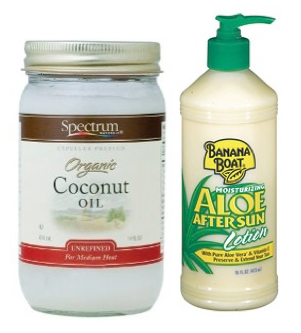 And of course, I recommend using that lotion combo all summer, as it’s a great skin saver and tan extender. Couple disclaimers: If you can handle an ice bath, go for it, but it’s not for everyone. And keep showers on the cooler side (not super hot) as that will only intensify the burn (duh). Also, if you literally have third degree bubbling burns (gross) on your body, these tips will not help; go see a doctor and also maybe reevaluate your life choices.